BORN in London, 14th March, 1850 Alfred Bennett achieved some notable accomplishments in his life. He was responsible for pioneering work in incandescent electric lighting in the early 1880s. He also patented an iron-alkali battery, a ceramic telegraph insulator and a telephone transformer. In 1895 he established a telephone system in Guernsey and later became engineer to the municipal telephone systems in Glasgow, Tunbridge Wells, Portsmouth, Brighton and Hull. 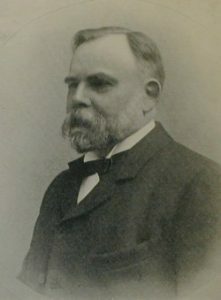 He was also the first Engineer Manager of the States of Jersey Telephone Department. He had a lifelong interest in railways and was vice-president of the Institution of Locomotive Engineers in 1915. That said, we’re not precisely sure who first conceived of the idea of providing a public telephone system in Guernsey. However it is on record that, in 1895, Jurat Major General Mainguy, sought the advice of an old Army colleague of his, distinguished telegraph and telephone engineer, Major General Webber. Webber then recommended the services of a Mr. A. R. Bennett, a fellow member of General Webber in the “Telephone Defence Association”. And so it was that in 1895 Alfred Bennett came over to the island to advise and assist the States in establishing their own telephone system. The British Post Office (GPO) held a monopoly on telephone services in the British Isles, and anyone wishing to operate a telephone system first had to obtain a licence. So, at first the British Post Office (GPO) was approached, but when they came back with a proposal that only the privileged few would be able to afford, Guernsey decided to look at alternatives. The commercial potential of this ground breaking technology was clear to all which was why in the meantime the National Telephone Company tried to steal a march on any States enterprise. It’s most blatant attempt to obstruct Guernsey’s plans for an independent system came in June 1895. when they took, what was later described as “steps to occupy the island”. The company secretly brought workmen and equipment into the island, and one night they erected a telephone pole in the heart of the town centre. Then, without permission, it ran wires from this pole over the roofs of houses to chimneys, walls and ridges. The Constables of the day, however, saw things differently and cut down the wires and then successfully defended their action before the Courts and Privy Council. The States in the meantime continued on with plans for a “Guernsey solution”. Which was why, in early 1896, a series of public meetings were held in various parts of the island to try to stimulate interest in the new invention. The enthusiasm which this generated led the States, on 17th June, 1896, to appoint a Telephone Council, charged with the duty of establishing and working a telephone system. Funds were voted to enable the project to get under way and the Council got straight down to work, meeting for the first time on 20th June 1896. Almost their first decision was to introduce a low tariff so that the new invention could become available to the largest possible number of people. Before the Council could proceed it was necessary, since the Telegraph Acts had been registered in the island, to apply to the Postmaster General in the UK for a licence to operate the proposed telephone system. However the GPO was unwilling to grant the licences. Negotiations became very drawn out, with almost 18 months passing before a licence was finally forthcoming. The licence was signed on 31st December, 1897, and so the telephone came to Guernsey.